Several navigational aids exist in and around Funter Bay to guide vessels entering and traversing the area. 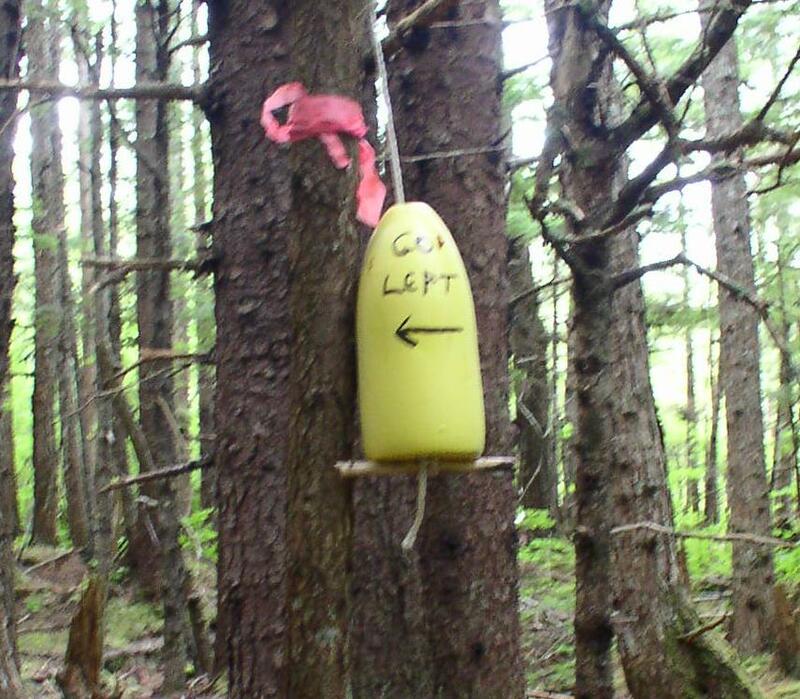 These include the Clear Point light, the “Green Can”, and the Naked Island light, as well as some informal private markers and buoys. 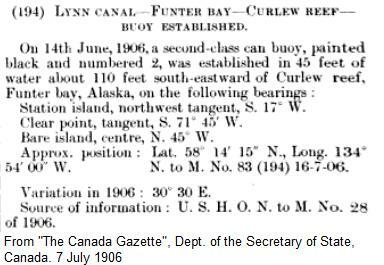 The “Green Can” buoy near the entrance (Marking Curlew Reef) was the first official navigation marker in Funter Bay. It was originally a Black Can when installed in 1906. It was located slightly to the NE from the current Green Can. This buoy indicates that vessels should pass to the right when entering (keeping the buoy off the Port side) to avoid the reef off Bare Island. Naked Island Light. 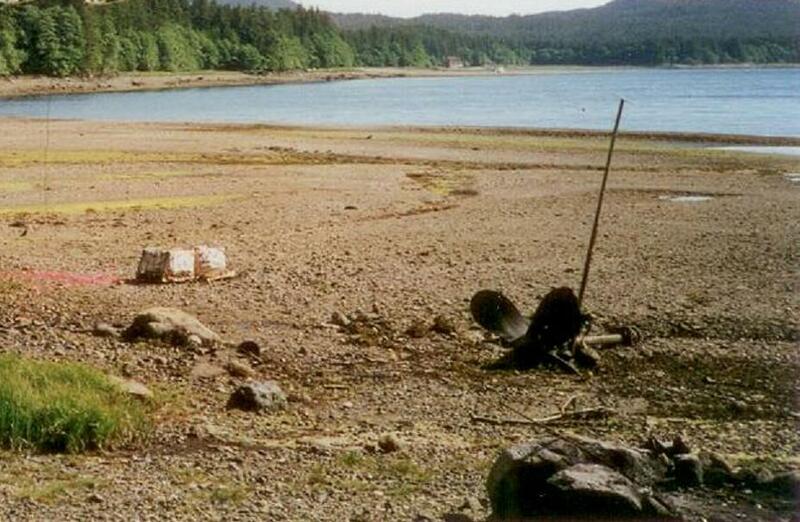 Photo from Alaska Shorezone project, used as public domain. 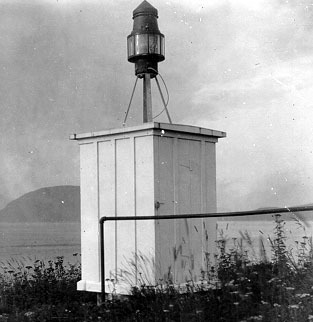 The Clear Point light was established in August of 1915, and consisted of a flashing white light of 15 candlepower, with “flash 0.2 second, eclipsed 1.8 seconds”, installed in a “small white house on Clear Point, northern side of the entrance to Funter Bay”. 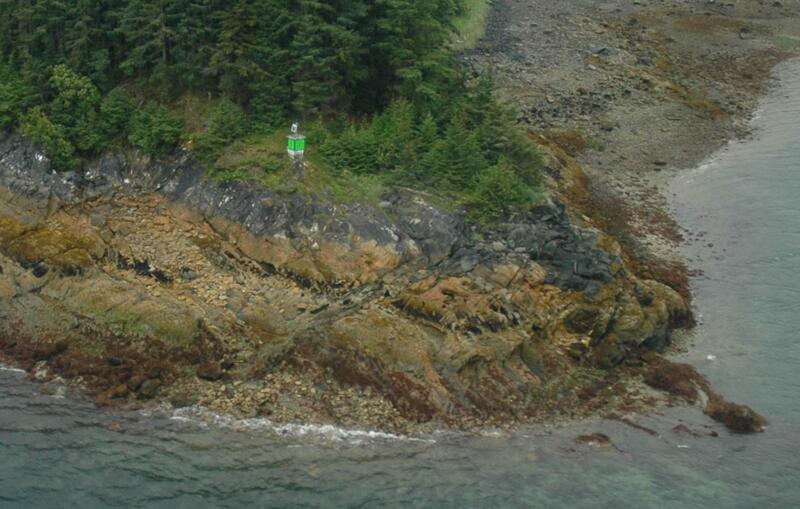 Photo from Alaska Shorezone project, used as public domain. Both were originally listed as acetylene gas lights, some information on such lights can be found here. Devices invented early in the 20th century allowed gas lights to flash automatically at night and shut off during the day through use of a heat-operated “sun valve”. Early acetylene lights used calcium carbide with a water drip system to generate the gas, similar to a miner’s headlamp, as it was considered unsafe to compress acetylene. Later systems used compressed storage tanks after the technology had improved. 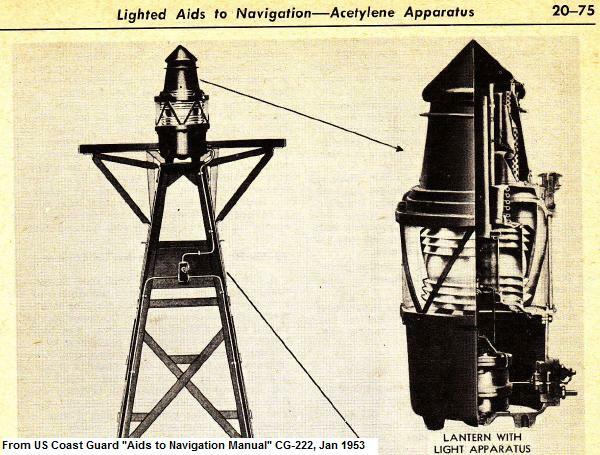 Solar panels and batteries began replacing gas lights in navigational aids in the 1950s, although some lighthouses and beacons used acetylene into the 90s. Based on the changed notation on charts, Naked Island’s light seems to have been upgraded around 1971, and Clear Point around 1974. 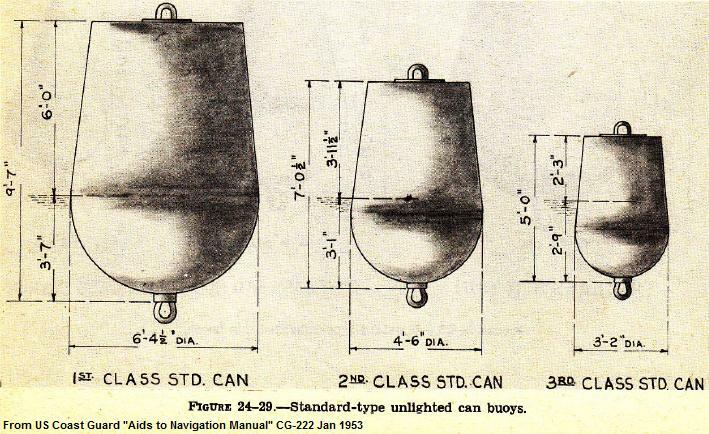 Color tests in 1979 proved that green-colored buoys were more visible that traditional black cans. 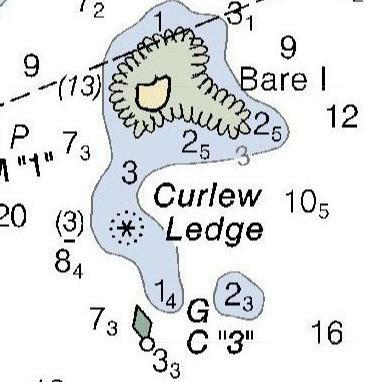 The can at Curlew Ledge changed color between 1978 and 1987 according to navigational charts. 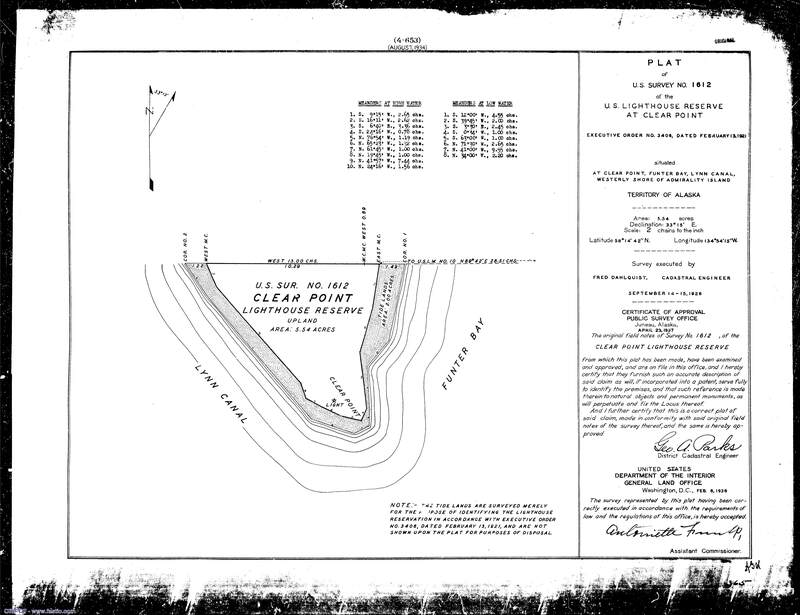 Modern charts describe the Clear Point light as green with a 2.5 second period, 16ft above mean sea level on a platform marked “1”. 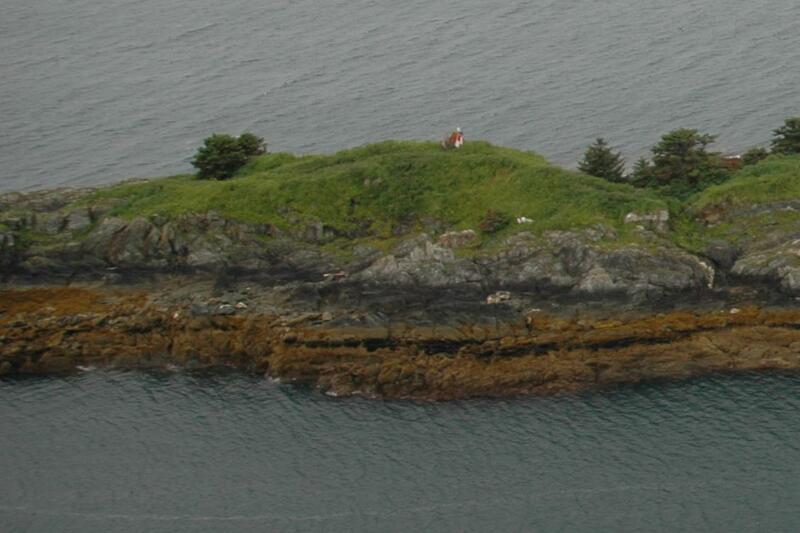 The Naked Island light is noted as being 44′ above sea level with a 6-second period, not numbered. 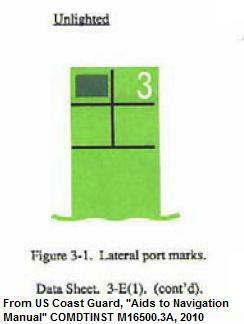 The Green Can is marked with a number “3”. The original Black Can was in almost the same location and was first marked “2”, and is shown on later charts marked “1” No marker numbered “2” is nearby presently. Buoys and lights were initially installed and maintained by the US Lighthouse Commission, today they are under the jurisdiction of the US Coast Guard. Special buoy tender vessels provide regular maintenance to these navigational aids. The closest manned light station was the Point Retreat Lighthouse at the Northern tip of Admiralty Island. Initially completed in 1904, it was later unmanned and downgraded in 1917, then rebuilt and re-manned in 1924, then automated again in 1973. It is now privately owned and there are plans to make it a museum and B&B. Private navigation markers are sometimes placed on rocks, reefs, wreckage, or other obstructions, and are not consistently styled or maintained. The most common is a stick or pipe which protrudes above the water surface at high tide, marking a submerged object which could endanger a boat. Small buoys may also be anchored to such obstructions, although they tend to become covered with barnacles and sink after a few years if not maintained. Below is a pole marking the old tugboat propeller in our front yard, at high tide the water would often cover the propeller, hiding it from skiffs and planes coming ashore. The pole was a popular perch for birds, especially kingfishers. 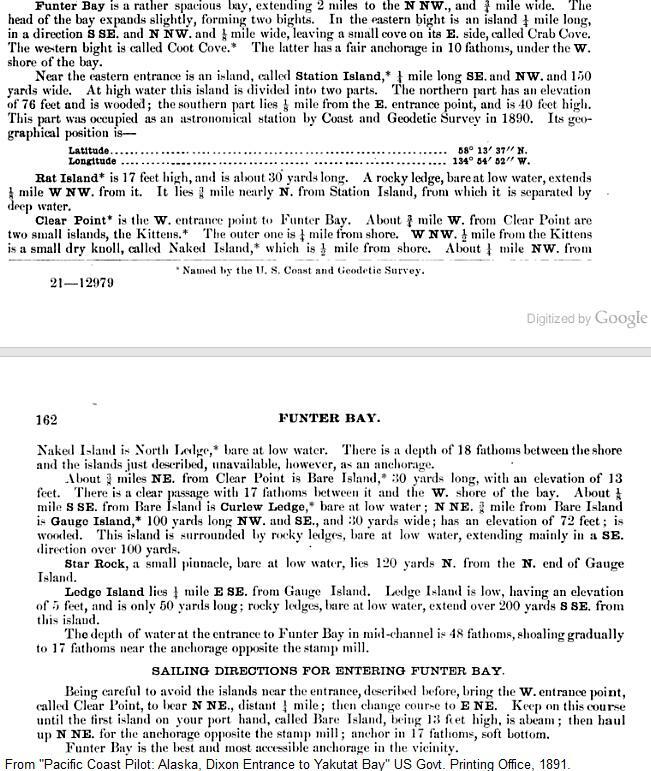 This entry was posted on Thursday, May 29th, 2014 at 12:07 pm and is filed under Alaska History, Funter Bay History. You can follow any responses to this entry through the RSS 2.0 feed. You can leave a response, or trackback from your own site. I love this yellow buoy, Rich put it up for Luisa to find her way to our cabin.